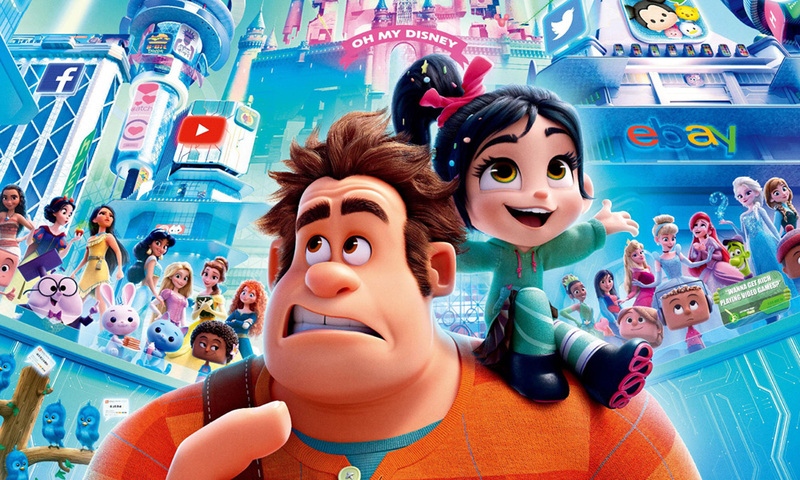 After what must have been a short discussion by the execs at Disney, where they wanted to clone the success of their Toy Story franchise somehow, the concept for 2016’s Wreck-It Ralph was born. Instead of toys coming to life when they aren’t being played by humans, think video game characters. Brilliant. Or it would have been if it wasn’t so poorly executed. Not one to cut off a potentially lucrative revenue stream, Disney green lit a sequel, and six years later, the decidedly average character of Ralph returns, with a bunch of familiar faces. Everything is just fine and dandy at Litwak’s arcade. All the characters are happily taking part in their respective games, including Ralph (John C. Reilly). But everything is a little too cosy for his young friend Vanellope (Sarah Silverman). She’s starting to feel that her cute racing game Sugar Rush, is a little on the dull side. In an attempt to cheer her up, Ralph creates a different path in the game, just for her, which takes her into exciting, unknown territory. This thrills Vanellope no end, but not so the gamer playing; as she struggles with the steering wheel trying to control the car, the wheel controller breaks, and the company that made the game is no longer around. This means that the plug will literally have to be pulled from the game, leaving all of its characters, including Vanellope, gameless. There is a glimmer of hope however; one of the kids in the arcade mentioned that an exact controller was available on something called eBay which was on something called the internet. As luck would have it, Mr Litwak (Ed O’Neill) is just in the process of connecting the arcade to the super information highway. Ralph decides that to keep Vanellope’s game going, the pair will visit the internet and get their hands on the game controller. It sounds a simple plan, but both are completely unaware of the dangers lurking in the global communications hub that is the net. OK who's hogging the spliff. is it you Ariel? They say that playing video games are bad for you. They say that the internet is bad for you. So how bad could a Disney film about a video game character going on the internet for the first time be? The answer is, woefully bad. You would think that Disney would have tried a little harder, considering there’s not even an ounce of originality to this Toy Story rip-off. But the fact that they’ve used such an obvious story mechanic only highlights how lame this franchise is. And that’s not even the worst of it. There is so much negative messaging in this film that it’s likely to corrupt the next generation beyond salvation. The first storyline that young audiences have to digest is that if you want something bad enough, just steal it. The two main protagonists don’t have enough in the way of money to buy what they want, so they decide to steal something expensive. What a powerful life message. The second involves social media. Again, when Ralph discovers they don’t have enough money for the steering wheel, instead of working hard for the cash, he’s encouraged to make silly videos and become a social media star to make a fast buck. So when there are drops in recruiting numbers for doctors, nurses, emergency service members etc in the following decade or so, we’ll know exactly who to blame. At least we’ll have a myriad of social media stars uploading hilarious videos of them farting into paper bags to keep us entertained. 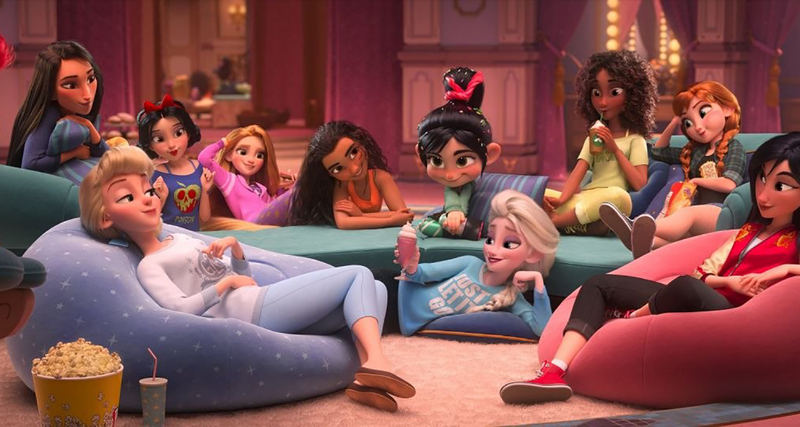 And then there’s the tedious, relentless Disney self promotion throughout, that culminates in a repulsive Disney princesses re-union and a vomit-inducing song. On top of that, there’s also far too much product placement going on, with a hideous amount of online retailers getting their logos in lights. That’s right Disney, make sure you’re brainwashing your audience to become active consumers in the future. It’s all rather mind-blowing, and really quite outrageous that Disney can get away with it. And don’t even get us started on the creepy relationship between a grown man and a young child. If this was going on in the real world, you would hope that someone would a drop a coin to social services to put a stop to it by now. The animation itself is quite impressive, but if you make your product attractive to consumers, they’ll buy into it more. It’s a cynical view for sure, but there’s just no escaping the many heinous messages this film shouts out. The irony is that the film saves its two best gags for the end credits. A small reward then for the endless adverts and consumer brainwashing served throughout. If the world does come to a grinding halt in the near future, it would be no surprise at all to learn that this film was the cause. Not only for your own sake, but for that of all humanity, avoid.